*Some trailers pictured in this catalog are shown with optional equipment. All boats and launching locations are not the same. Therefore, trailers vary in style and purpose. The characteristics of each require that you consider several important items prior to your trailer purchase. Determine the following before making your selection. 1) The weight of your boat needs to include engine(s), fuel, gear and any factory added options that the builder did not include in its boat weight. This weight along with your expected trailer usage will determine the capacity of the trailer. Trailers are manufactured to carry a predetermined weight and should not be overloaded. 2) The Length of the boat from the pulpit (if included) to the engine mount. Remember, if you are towing with a van or camper you don’t want the pulpit over the coupler on the trailer. 3) The type. Many trailers are designed to allow the owner to drive the boat on and off. However, some ramps are too shallow to allow adequate submersion for the boat to load properly. Other ramps may have a drop-off at the water’s edge and will not allow proper launching. Be sure to determine if your trailer will perform adequately at your local marina. Choose the type (drive-on or roller) which best fits your needs. 4) Aluminum or Galvanized. Galvanized trailers offer a protective coating that normally prevents rust for several years. Aluminum trailers will experience virtually no corrosion and are somewhat lighter in weight. Both perform well in salt water. 5) Single or Tandem Axle trailers are available on all models 18’ long and larger. Both models have advantages and disadvantages. Single axle trailers are lighter in weight and easier to maneuver however, their weight capacities are less. Tandem models can carry more weight but are somewhat more difficult to back-up. If you plan to do a lot of long distance driving, consider choosing a tandem trailer for the safety it provides in case of a tire failure. 6) Wide boats and trailers may be subject to certain state towing laws. Please check with your state D.O.T. for regulations. Brake Laws. The State of Florida requires brakes on all axles of any trailer with a G.V.W.R. of 3000 lbs. or more. This means the combined weight of the boat, trailer and all equipment being towed. Most other states have similar laws. When selecting a trailer for your needs, be sure you comply with these legal statutes. Additionally, today’s lighter weight vehicles may not provide adequate braking by themselves. Drive safely; make sure your trailer has brakes installed. All trailer model numbers ending with “B” are assembled with brakes on all axles. These models are available without brakes; however, the load capacity is greatly reduced to comply with Florida Law. 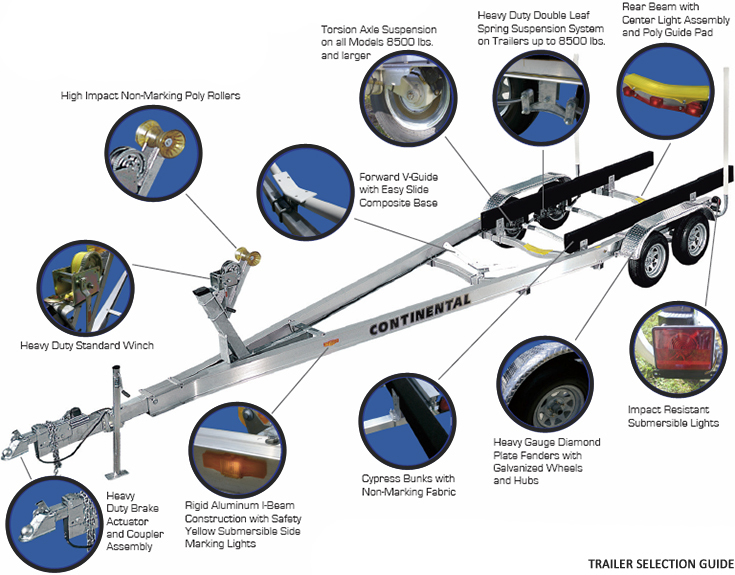 Water-Land Manufacturing offers a Limited Two Year Warranty on all Continental Trailers.